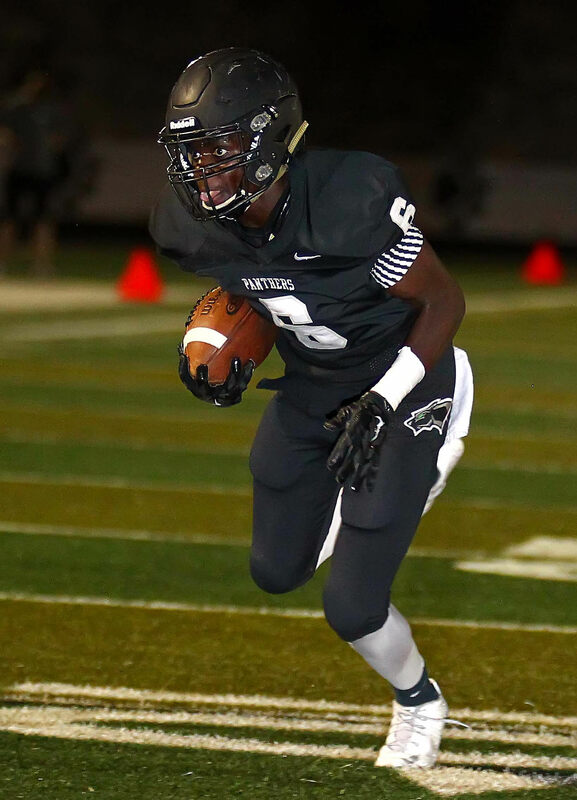 With a 1-5 week to open the 2016 season, it would have been easy to push the panic button in the 3AA South. 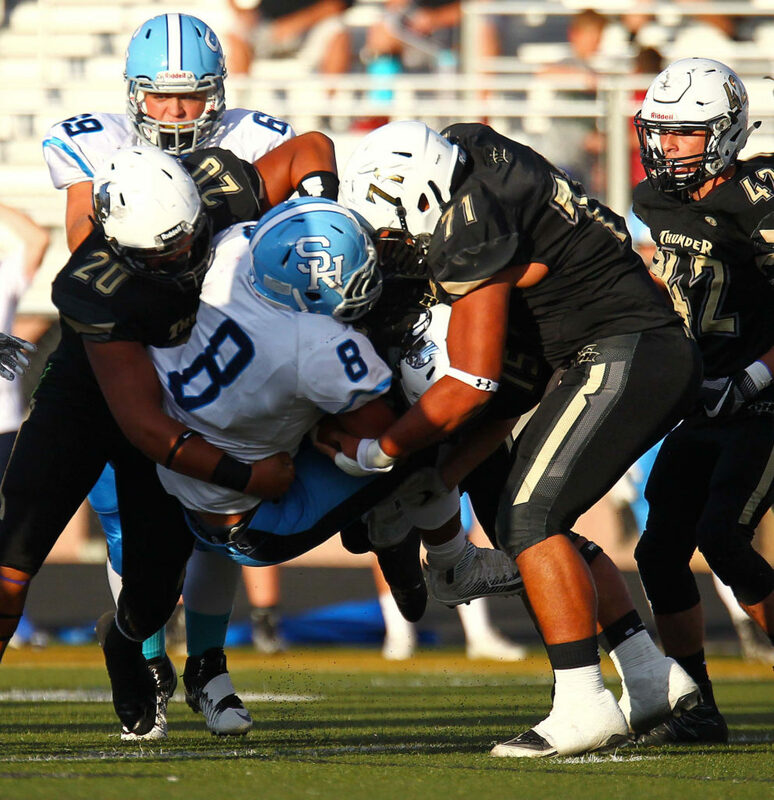 Week 2 was much more productive for most of the region, with Desert Hills and Pine View grabbing home wins and Cedar and Hurricane snatching wins on the road. 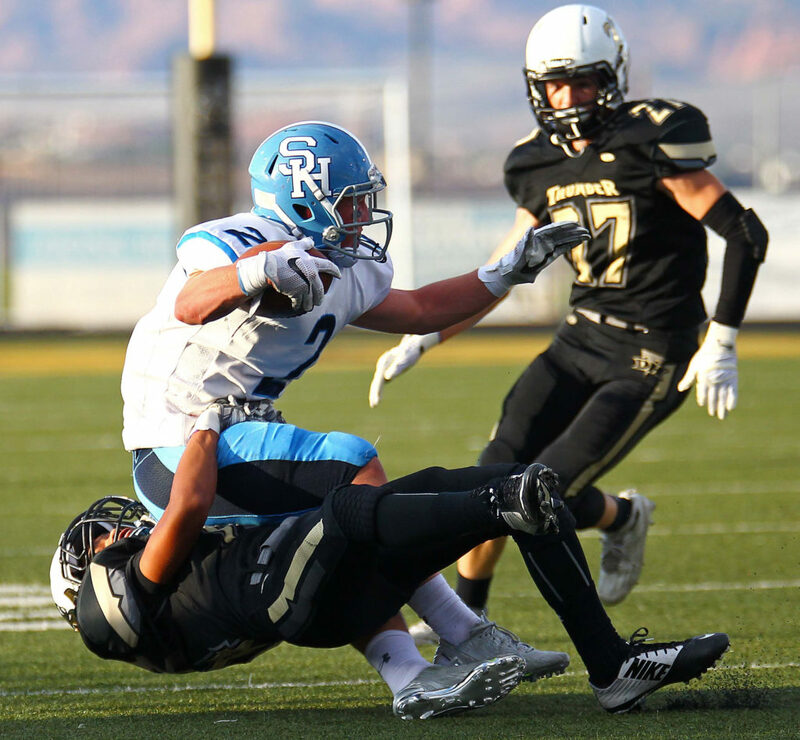 Dixie and Snow Canyon didn’t have as much success on the road, but battled against tough foes. The St. George News team, consisting of writers Andy Griffin, Darren Cole, Bob Hudson and Jordan Abel, photographer Robert Hoppie and videographer Dallas Griffin, spent the evening observing and recording the best of Week 2 for our readers. 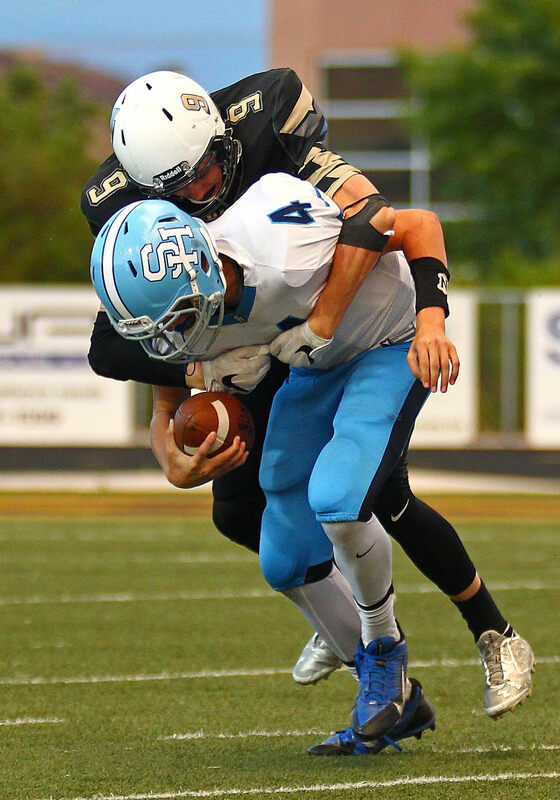 Also, a special thanks to CEC-TV for sharing their highlights from the Pine View-Uintah game with St. George News (edited by Dallas Griffin). 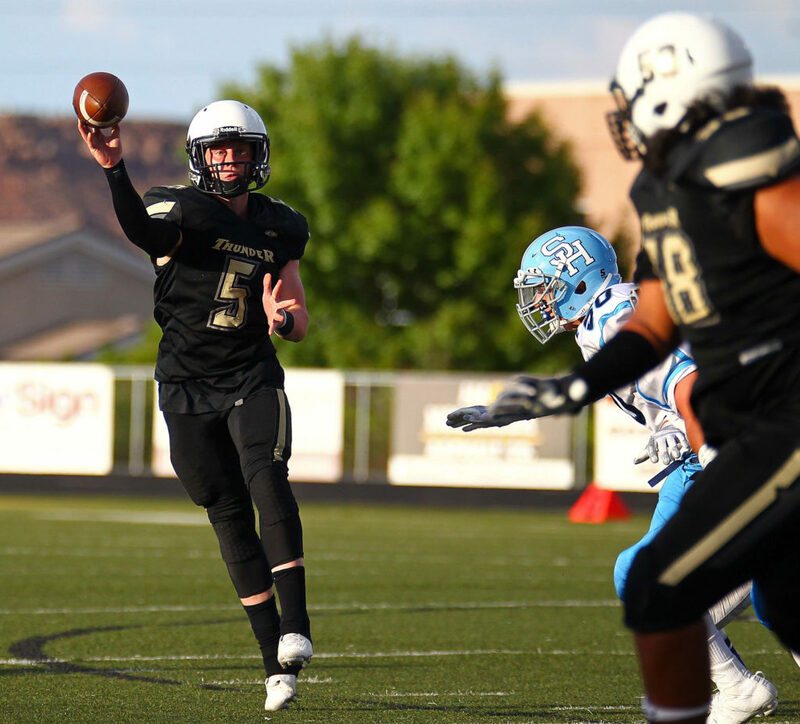 In St. George, Brock Parry scored twice inside the 10-yard line and Quinn Kiser had a touchdown pass and a touchdown run as Desert Hills downed Salem Hills 28-7 on Friday night. The Thunder led just 7-0 at the half, but surged over the final two quarters. Parry scored on runs of 9- and 1-yards. Kiser hit Braxton Porter with a 59-yard strike and later scored on a 5-yard run to follow up a 25-yard dash. Parry scored his first touchdown on the Thunder’s opening series, capping a 68-yard, eight-play drive. Logan Callister added the point-after. The rest of the first half, the defenses shone. The Thunder drove from their own 1- and 3-yard lines, thanks in part to spectacular catches for 38 and 34 yards from Logan Hokanson. But each time, the drives stalled. “I was just trying to make plays for my team,” Hokanson said of those catches. “We missed a lot of plays,” Franke said. Meanwhile, Kiser praised the play of the defense. 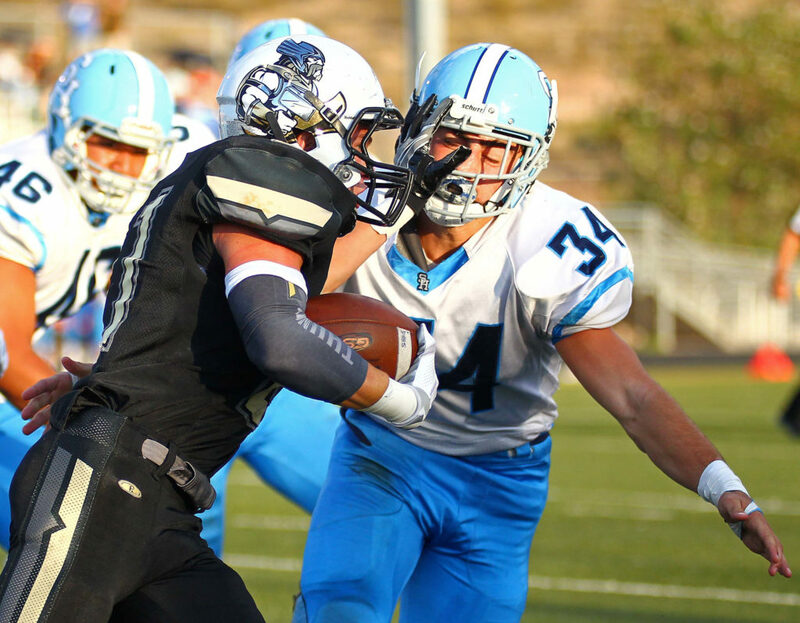 Salem Hills had a chance to tie the score in the final seconds of the second quarter, but Carter Reynolds’ sack of Skyhawks quarterback James Nelson ended that threat after they had reached the DH 23. He had another sack at the end of the game. Kiser finished with 223 yards on 11 completions. He suffered one interception, but the defense stalled that threat at midfield. 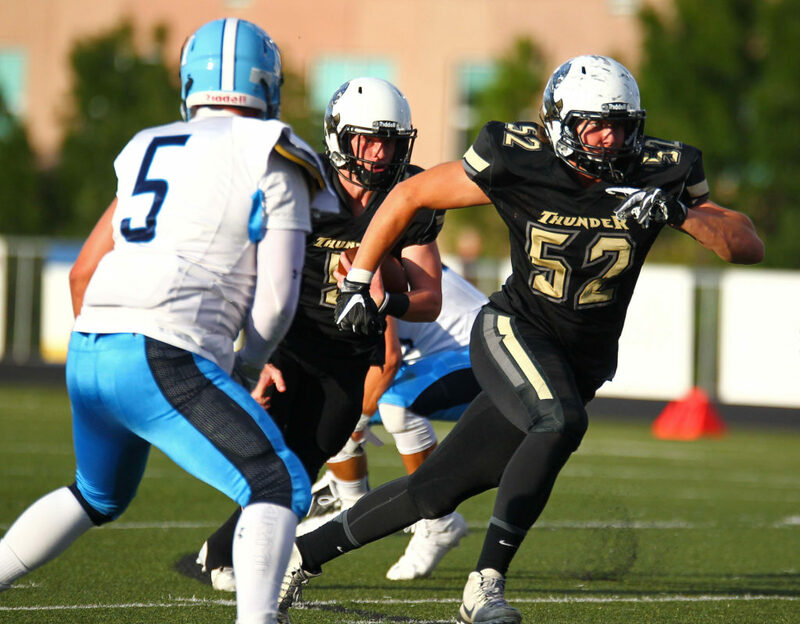 His favoorite target, by far, was Hokanson, who had six catches for 133 yards, including those of 38 and 34 to get the Thunder out of the shadow of their own goal posts. 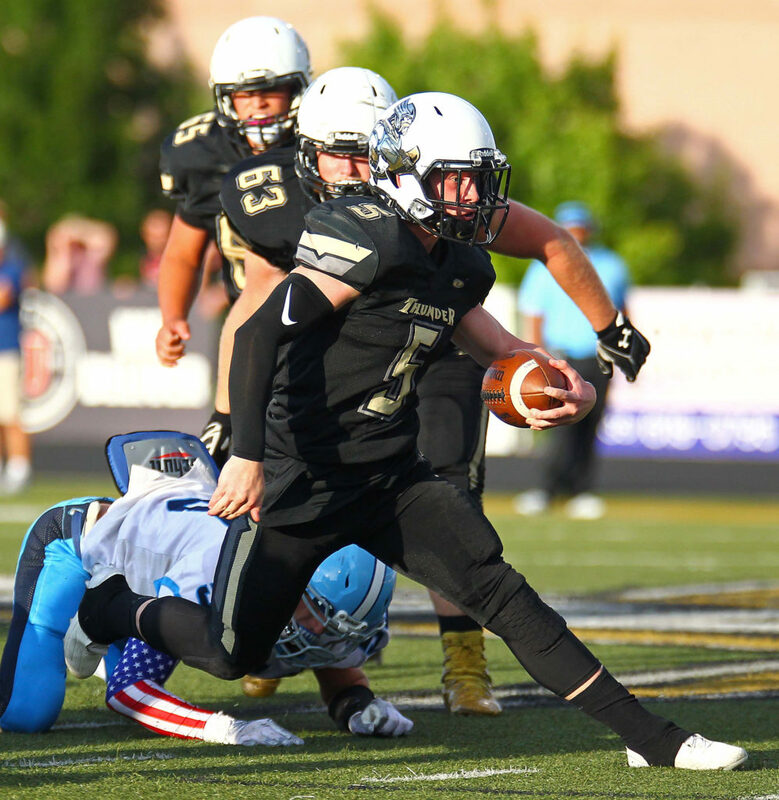 Desert Hills’ second touchdown came on its next series with Parry picking up chunk by chunk before Kiser connected with Porter, who was behind the defense. Freshman Noah Sewell recovered a fumble at midfield to set up DH’s third touchdown. Parry picked up 11 yards on three carries before Porter and Marco Jordan had catches to close to the SH 9-yard line. Kiser had an 8-yard run before Parry’s 1-yard TD scamper. Salem Hills answered that score with one of its own. The Skyhawks used a series of short passes to reach midfield. Then they picked up about 40 yards on three consecutive penalties before finally scoring on Williams’ 8-yard pass to Cole Jacklin. The point-after brought the score to 21-7 with eight minutes remaining. 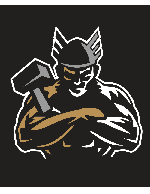 Desert Hills put the game away with a 64-yard drive, with two key catches from Hokanson, a big run from Parry and Kiser going the final 30 yards in two plays. “We’re just so well-conditioned, I think that they got tired,” Kiser said. Being the best-conditioned team is the Thunder’s mantra. Franke said he believed they were better-conditioned than Jordan last week and than Salem Hills this week. The three offensive players took the blame for the slow start. “We’ve always been a second-half team,” each said in turn. 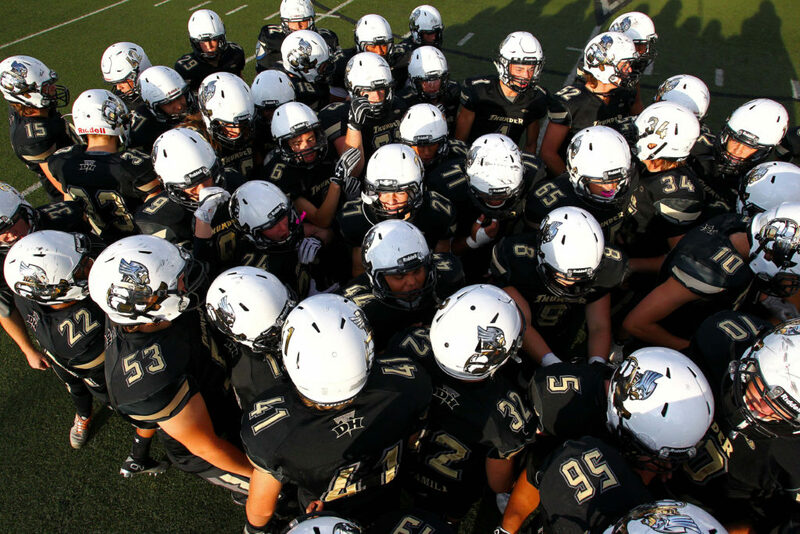 Desert Hills finished with 356 yards total offense while Salem Hills had 162, just 45 of it in the second half. 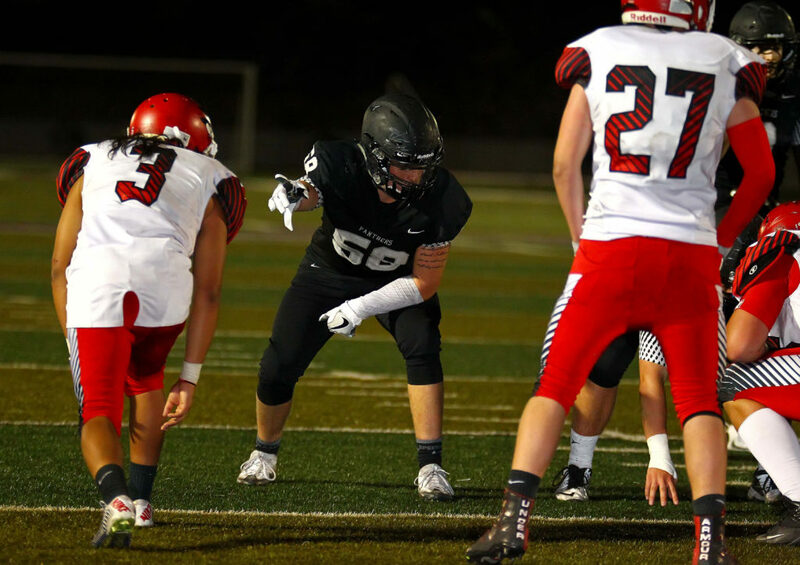 While he was disappointed with the Skyhawks’ touchdown, in large part because of the penalties that led directly to it, Franke reserved overall judgement until after he had watched the film. 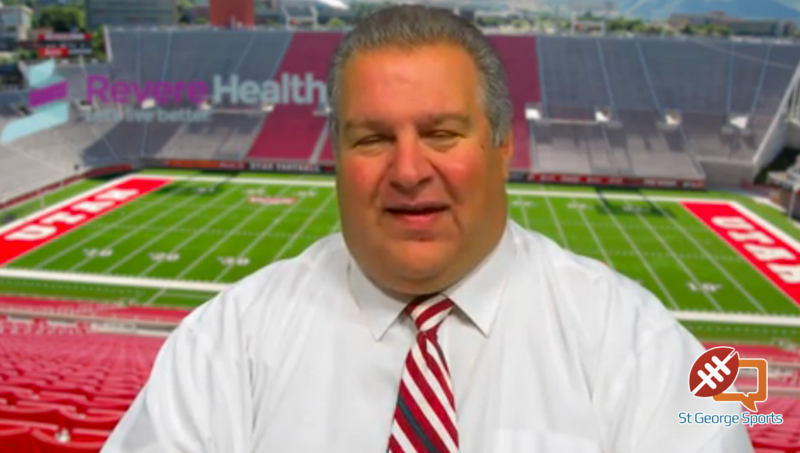 The Uintah Utes know firsthand. 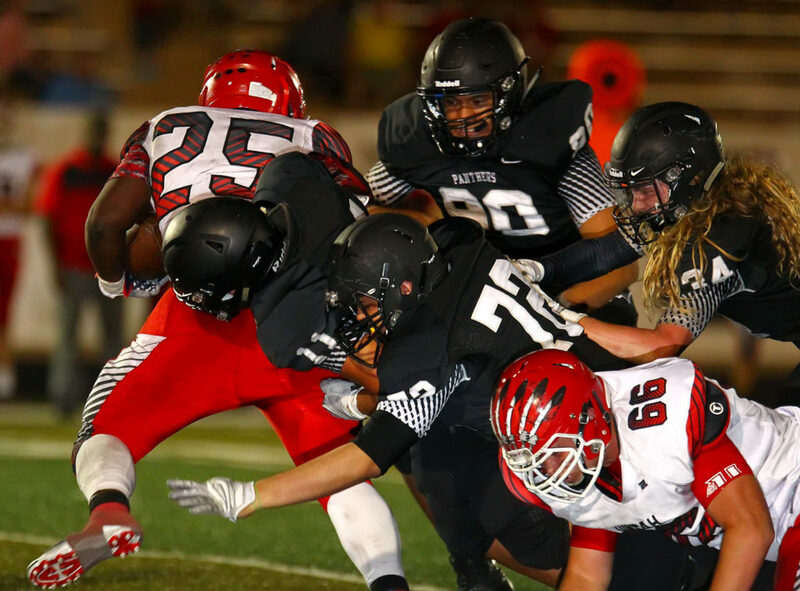 Heaton, Solo Katoa and the rest of the Pine View offensive and defensive front, owned the line of scrimmage Friday night as the Panthers roared past the Utes for the easy win. 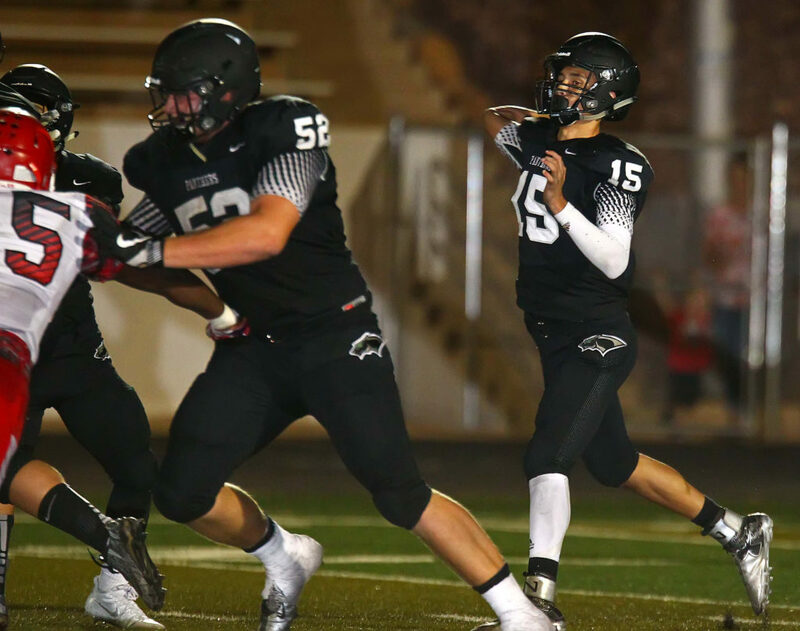 Heaton’s offensive hogs helped clear the way for 494 offensive yards, a whopping 7.4 yards per play, for Pine View. 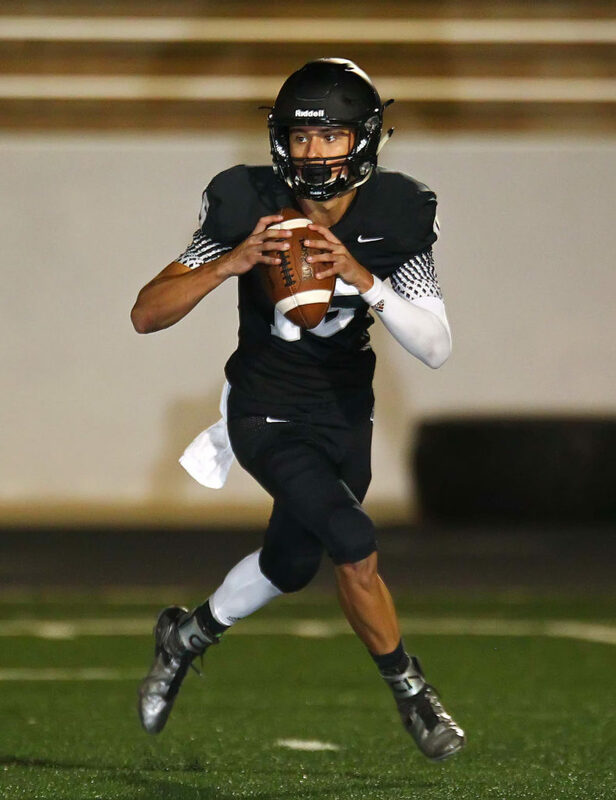 PV had 261 passing and 233 rushing in the game, with starting QB Ryan Javines racking up the bulk of the passing yards (255) and the quartet of Javines (56 rushing yards), Jacob Mpungi (90 yards), Jacob Brann (45) and Kawika Santiago (40) combining for most of the rushing yards. 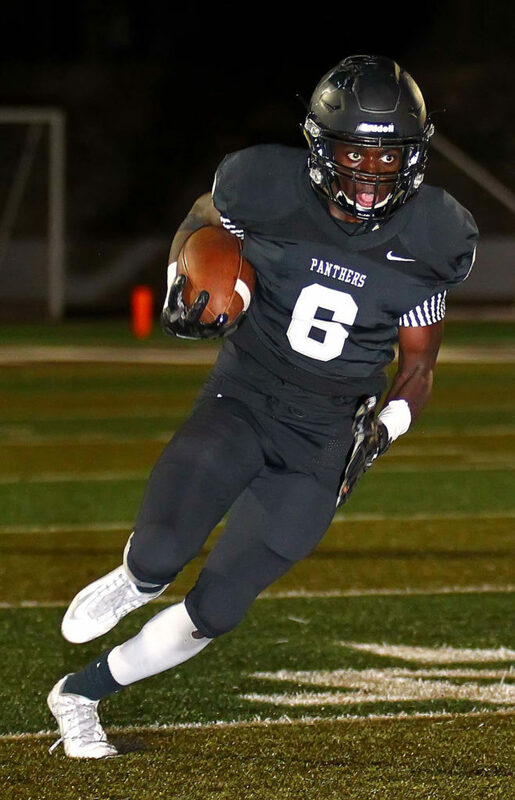 The Panthers scored their first touchdown in just 82 seconds, with Javines finding Michael Moten on a short pass that Moten turned into a long TD by making a couple of nice moves. 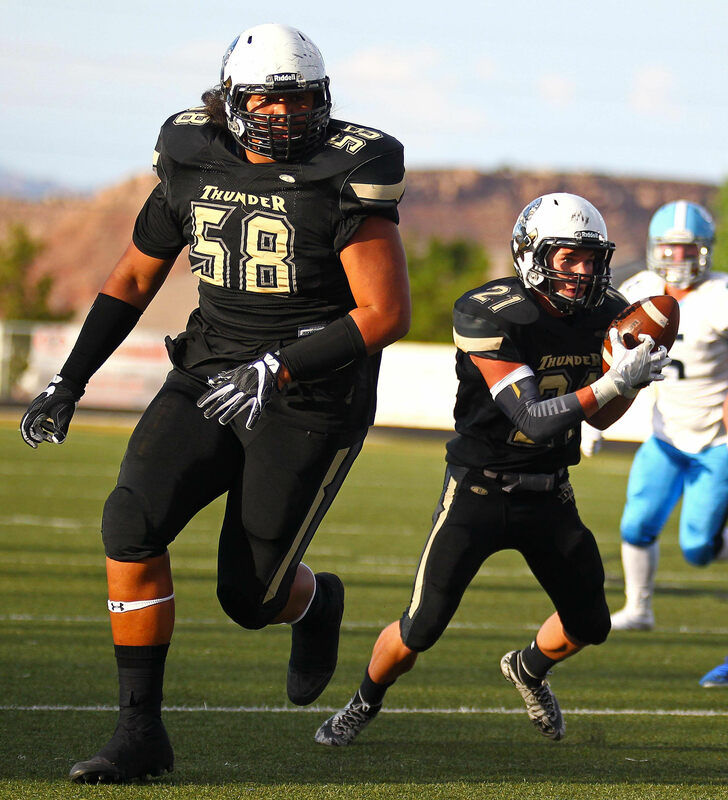 The 50-yard score made it 7-0, with Pine View pushing it to 13-0 just four minutes later after Deangelo Mpungi, Jacob’s brother, intercepted a Ute pass. The short field (35 yards) was easy money for Pine View with Javines ripping off a couple of runs and then Santiago taking it in from a yard out. Uintah got its only score of the night on the next possession as Treven McEachney hit a 47-yard field goal to cut it to 13-3. But the Utes would have very few highlights the rest of the night. 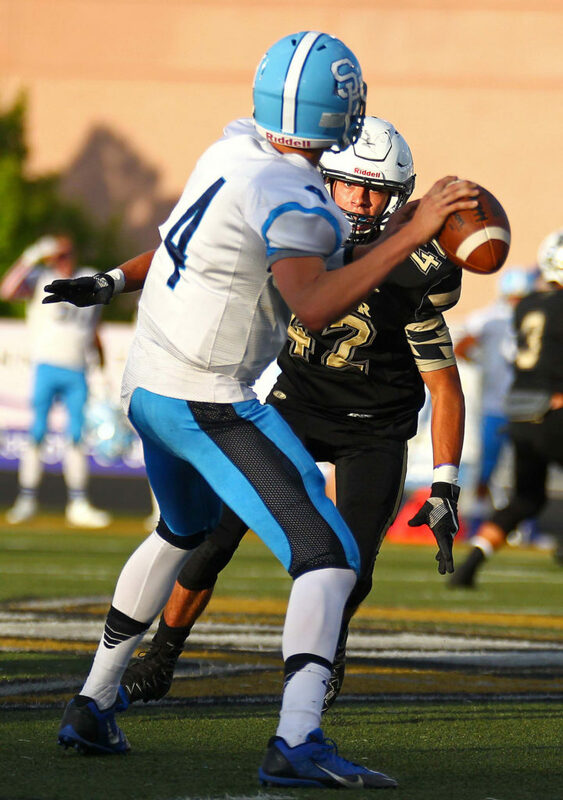 Pine View made it 20-3 early in the second quarter on a 9-yard strike from Javines to Santiago, then it went to 27-3 just before halftime when Javines executed a perfect play-action fake and hit tight end Daniel Larsen for a 2-yard TD pass. The onslaught continued in the second half, with Javines finding Carson Clark on a fly pattern for a 33-yard TD to make it 34-3. 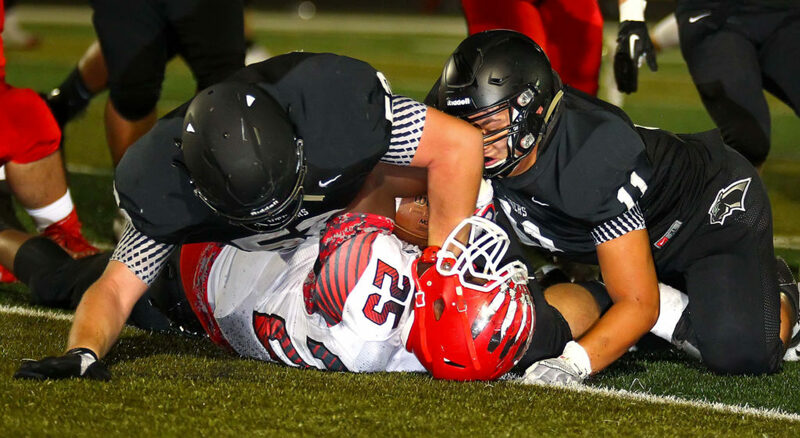 Two plays later, after a Heaton sack, Uintah QB Kyle Henderson lofted a pass that was picked off by PV’s Dylan Hendrickson at the Utes 36-yard line. He broke a couple of tackles and raced up the right sideline for a 36-yard pick-six that made it 41-3. 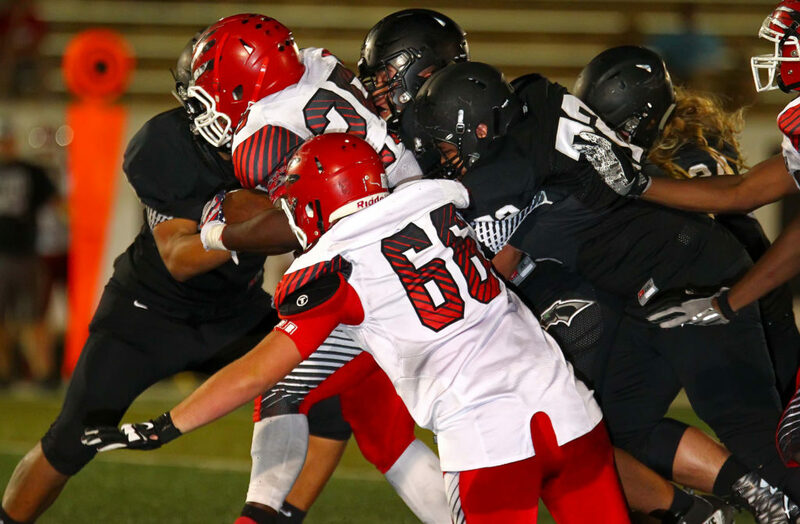 Jacob Mpungi added a spectacular 5-yard TD run early in the fourth quarter — he was corralled by three Uintah players only to leave them grasping air with a breathtaking spin move — to round out the scoring. 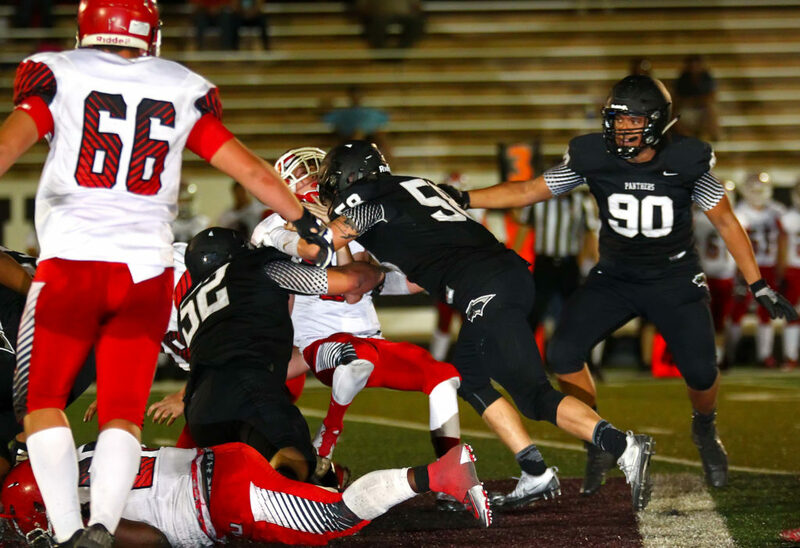 The defense was sharp as well for PV, allowing just 177 yards — just over three yards per play. 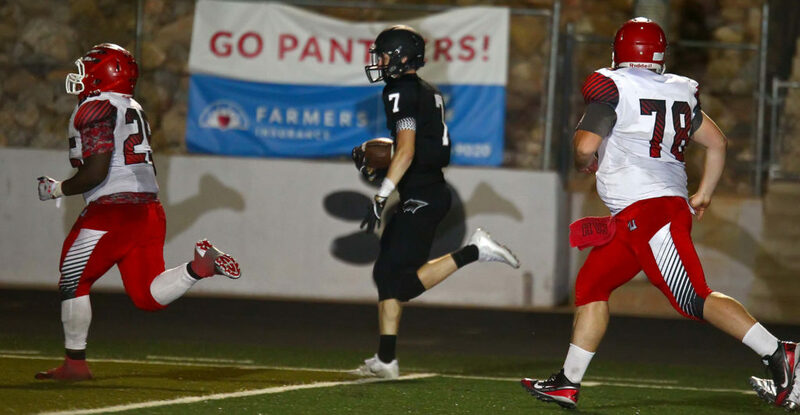 Uintah also turned the ball over four times, including two picks by Hendrickson. The Panthers, 2-0, travel to Manti next week. 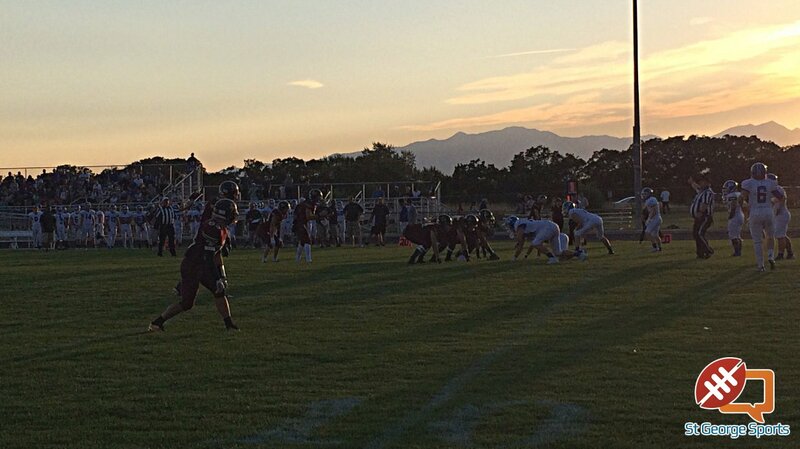 The Templars, 1-1, are a 2A school, but competed well Friday night against Juan Diego in a 21-17 loss. The Tigers may or may not be the best team in the 3AA South. But right now, they are the most exciting. 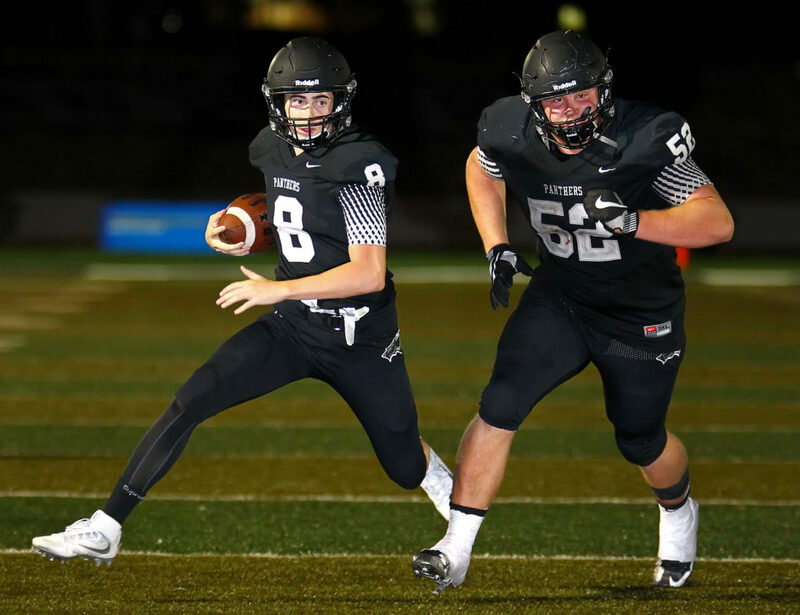 After losing to Skyline last week in overtime after a gritty comeback, the Tigers again faced a deficit late into the fourth quarter at Canyon View. Down 16-14 due to a failed 2-point conversion, Hurricane took over possession after a turnover on downs by the Falcons with 6:11 remaining. 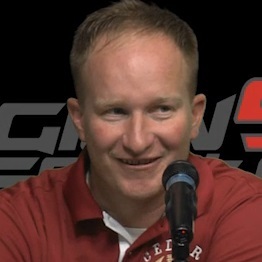 Six out of Hurricane’s first seven plays on the drive netted first downs. The coup de grace came with 3:34 remaining when Tiger quarterback Josh Parker hooked up with wideout Riley Ballard for a 35-yard touchdown. It was the second TD connection between the two and, even with another failed two-point conversion, the Tigers held a 20-16 advantage. On the ensuing kickoff, the Falcons returned the ball to their 42-yard line. 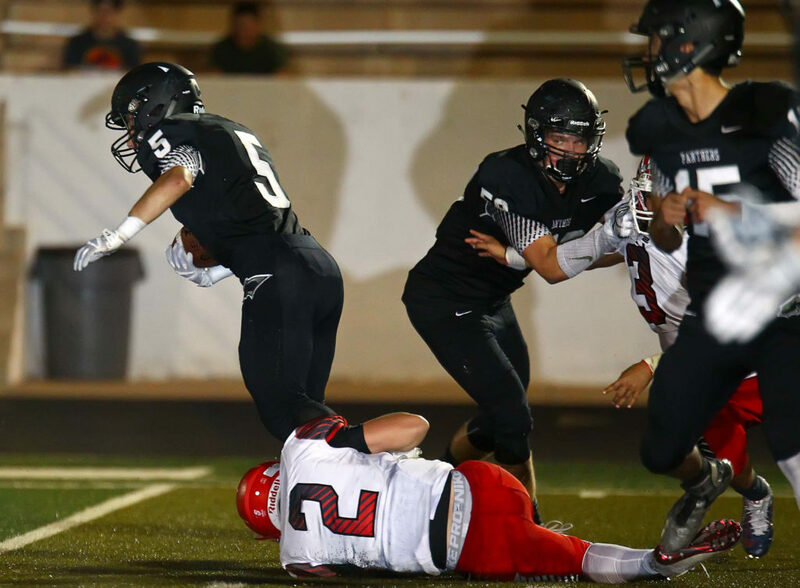 After Canyon View gained 22 yards on two first-down plays, the Tiger defense stiffened. 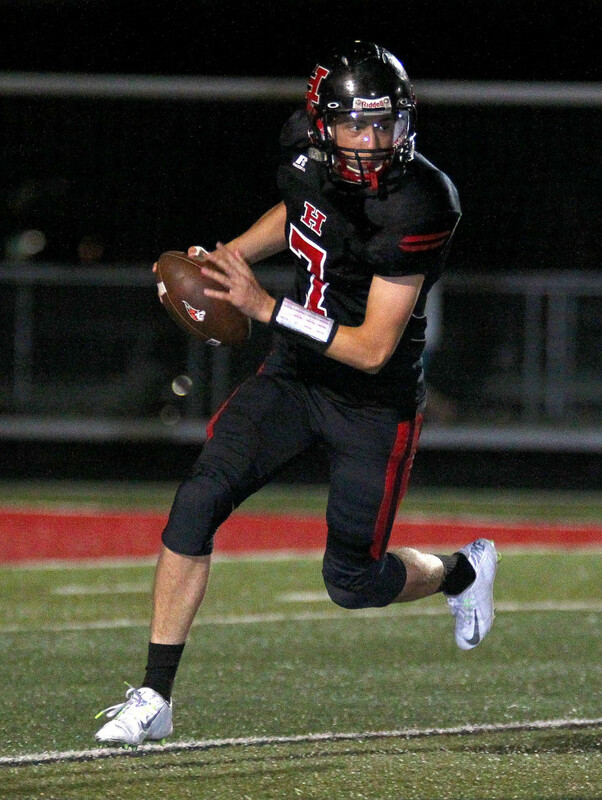 Hurricane had been playing catch-up all night as the Falcons took an early lead in the first. Falcon quarterback Stockton Rigby scored on a 1-yard keeper with 8:50 showing in the first. With the two-point conversion, the lead was 8-0. A punt return by Kolby Heaton gave the Tigers good field position at the Canyon View 39-yard line in the second quarter. Seven plays later, Parker hit Ballard with a 10-yard strike. Parker connected with Ballard again on the two-point conversion to knot the score at 8-8 with 7:33 remaining in the half. The score would remain that way going into the locker rooms. 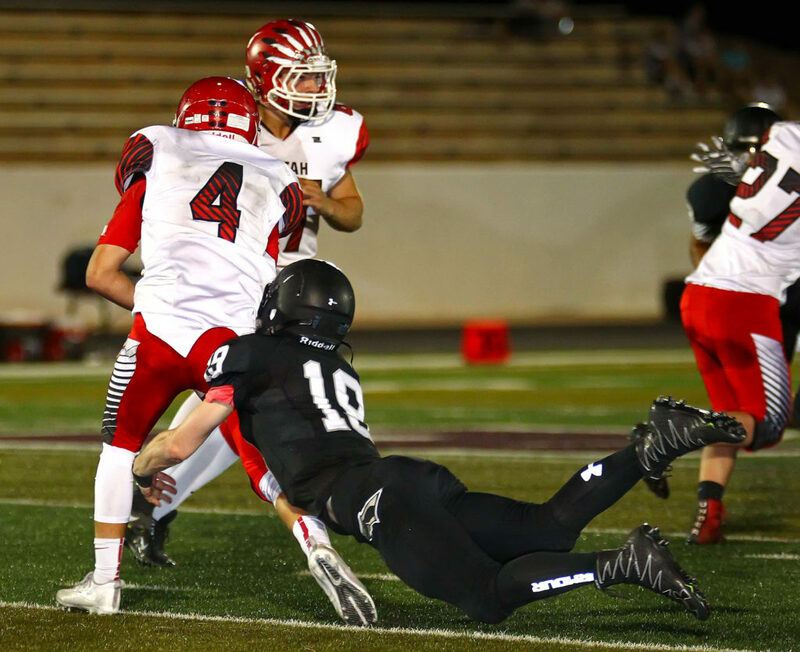 In the second half, the Tiger defense had pinned Canyon View back to its own 3-yard line on its first possession. Isaiah Shearer then sprung through the middle for a 97-yard run. Shearer added the two-point conversion to put the Falcons back up 16-8 with 7:33 remaining in the third quarter. On the ensuing possession, Parker drove the Tigers 64 yards in less than three minutes. This drive ended with a 12-yard run by Ballard. However, Parker’s pass on the two-point conversion fell incomplete. The Tigers trailed 16-14 with 4:46 remaining in the third. The Tigers were beset by turnovers on their next two possessions, giving the ball back with a fumble and an interception. But the Falcons failed to capitalize on either, setting up the final Hurricane touchdown drive. As a team, Hurricane outgained the Falcons 358-309. The Tigers also dominated time of possession minutes 28-20. Individually, Parker completed 12 of 22 for 198 yards and two touchdowns. Jaron Cordova led the Tigers rushing for 81 yards on 18 carries. Ballard had 135 yards on seven receptions. Hurricane moves to 1-1 and will travel to Moapa Valley, Nev., next week to take on the Pirates. Canyon View falls to 0-2 and will face cross-town rival Cedar next week. Without their sideline leader, the Cedar Redmen went down to Mesquite and came back with a decisive win over the Virgin Valley Bulldogs. Cedar head coach Josh Bennett wasn’t with the team in Mesquite for personal reasons, so coach Mark Esplin helped lead the team to victory. Esplin said it’s been a tough week without Bennett, but thanks to a lot of help from the other assistant coaches, the team has been able to keep going without him and earn its first win. 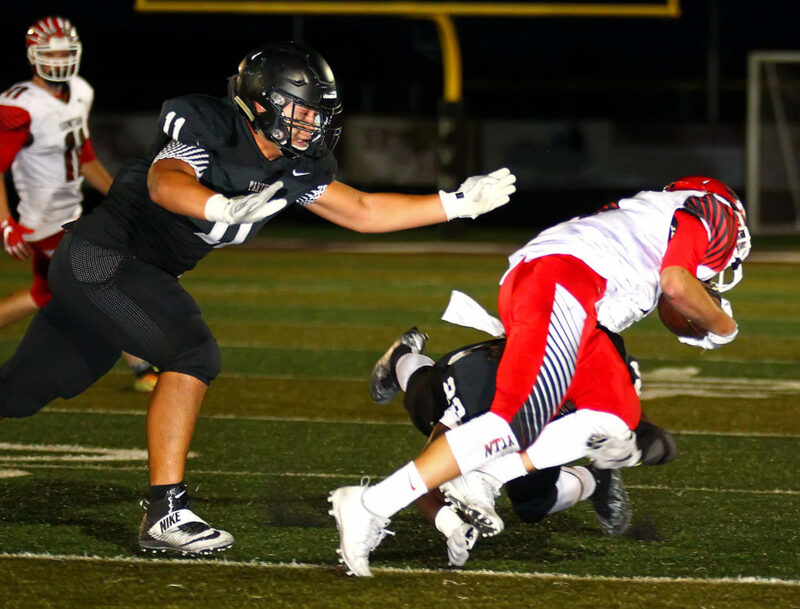 The Bulldogs scored first and held Cedar scoreless in the first quarter, but Cedar responded with 34 unanswered points before the Bulldogs found the end zone again. 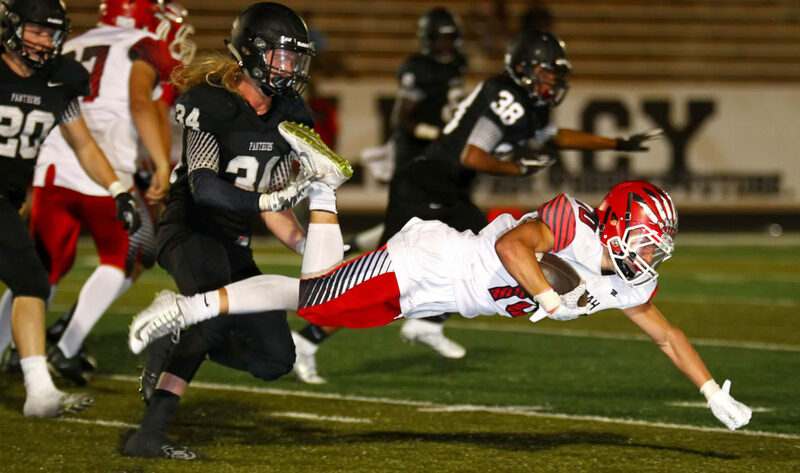 It was a blustery night, but the Redmen adjusted in the second quarter as Mason Fakahua and Braden Garrett connected on a 25-yard pass for Cedar’s first score. Shortly after that, Fakahua found Drake Lewis for another 25-yard touchdown pass. The second half started the same way the first half ended, with Cedar finding the end zone two more times throughout the third quarter. Penalties seemed to be an issue for the Redmen, but not enough to hold them from coming out on top. Cedar then scored early in the fourth quarter to seal it before Virgin Valley finally scored its second touchdown of the night late in the fourth quarter. Fakahua had a huge night on the ground as he had touchdowns runs of 32 and 64 yards. Lewis scored the other touchdown on a 35-yard rush. 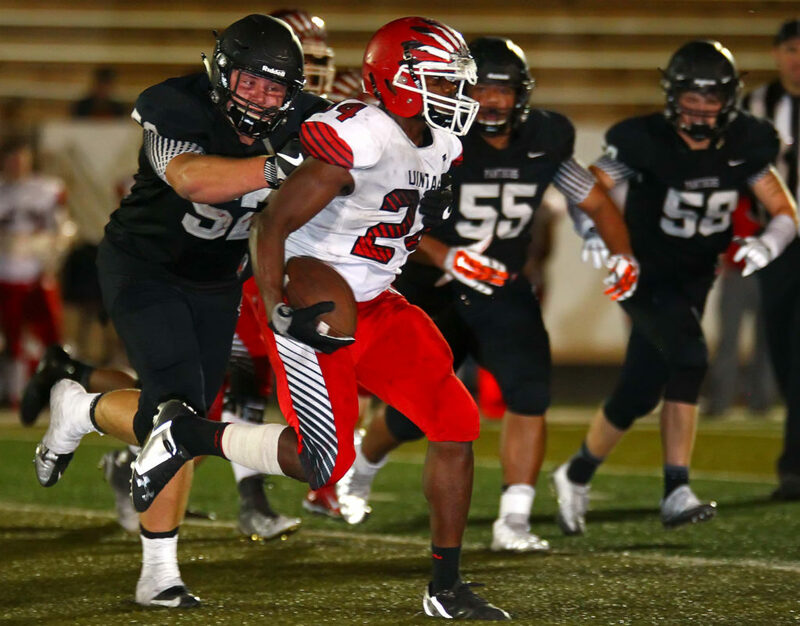 Cedar will finally play in its home opener against Canyon View in the rivalry grudge match on Sept. 2. Kickoff is scheduled for 7 p.m.
Bennett plans on returning to the playing field throughout this week for practice and coaching against the Falcons next week. “We dedicated this win to coach Bennett. We’re looking forward to getting him back.” Esplin said. When you find your team down by 30 points and you have not reached halftime yet, most coaches would take a bleak perspective. Dixie head coach Andy Stokes lacks a defeatist attitude. 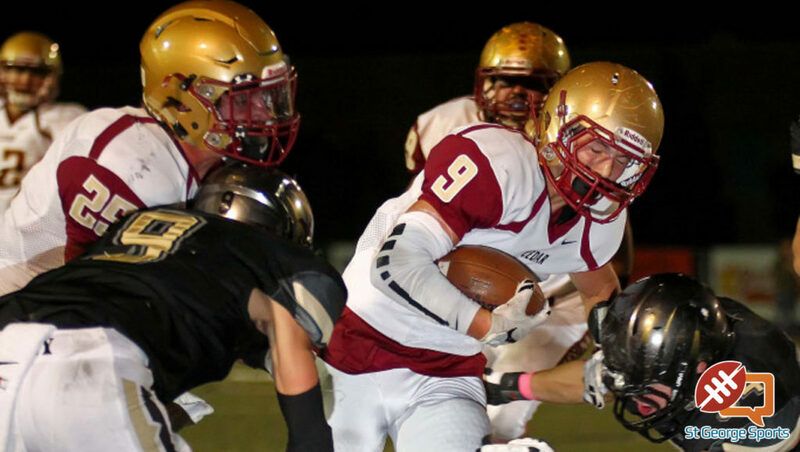 Lone Peak scored on its opening possession on a keeper by quarterback Dakota Hansen. 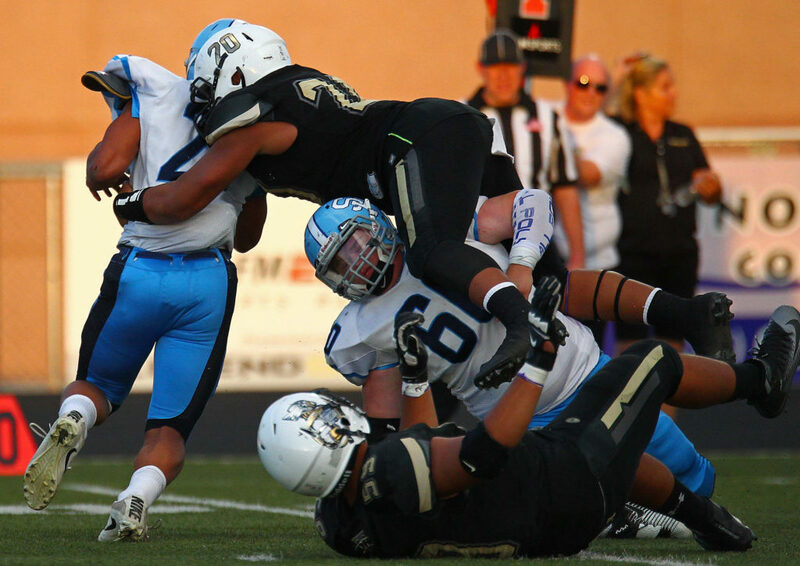 The PAT was unsuccessful and Lone Peak led 6-0 with eight minutes showing in the first quarter. After a Flyer fumble, the Knights took advantage of the short field two minutes later with a 36-yard field goal from Thomas Rossi. The Flyers coughed up the ball a second time. This time the Knights would put up seven with a 13-yard touchdown strike from Hansen to Tyler Macpherson. After a Dixie turnover on downs, Knight running back Jackson McChesney culminated the Lone Peak drive with a 1-yard dive. 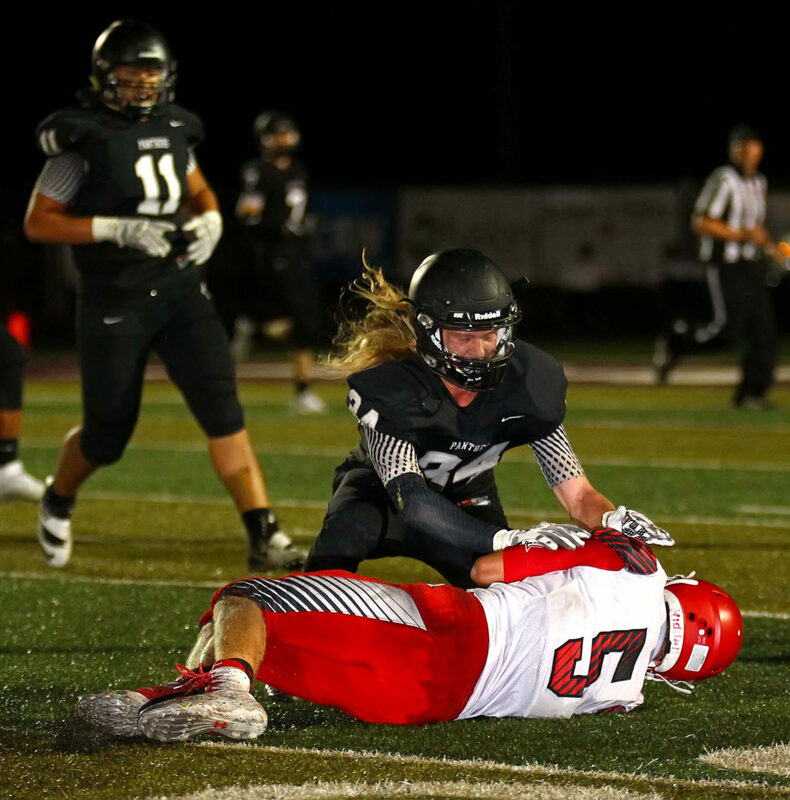 Lone Peak would score again with three minutes remaining in the half on a 5-yard pass from Hansen to Payton Freeman and things were getting ugly. Dixie finally got on the board seconds before intermission. Quarterback Jacob Barben found wide receiver Josh Topham with a 35-yard pass to cut the lead to 30-7. In the second half, Dixie matched Lone Peak possession for possession. The Knights scored another Rossi field goal on their first possession. But Dixie responded quickly with a 98-yard catch and run by Hobbs Nyberg, making it 33-14. 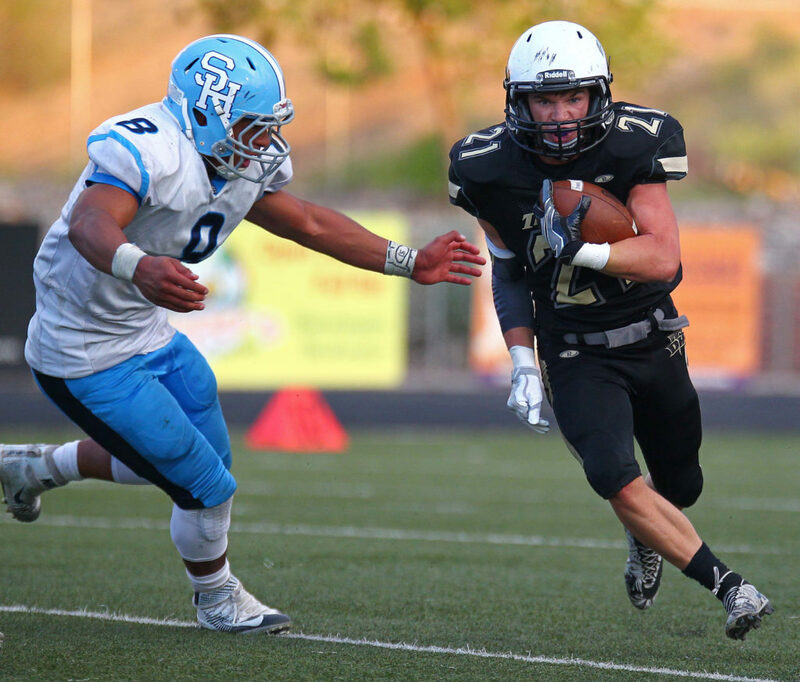 After forcing a punt, the Flyers hoped to cut the lead further, but Barben was intercepted by Lone Peak’s Seth Larsen, who returned the ball back for a touchdown to put the Knights up 40-14. Barben responded with another big pass play, finding Topham again, this time for a 70-yard touchdown. But the Flyers could not get the ball back. The Knights put the game away in the fourth with another touchdown with five minutes remaining to go up 47-21. Offensively, several players had outstanding performances. Barben had over 450 yards passing and three touchdowns. Nyberg had 245 yards receiving. Topham gained over 100 yards receiving. 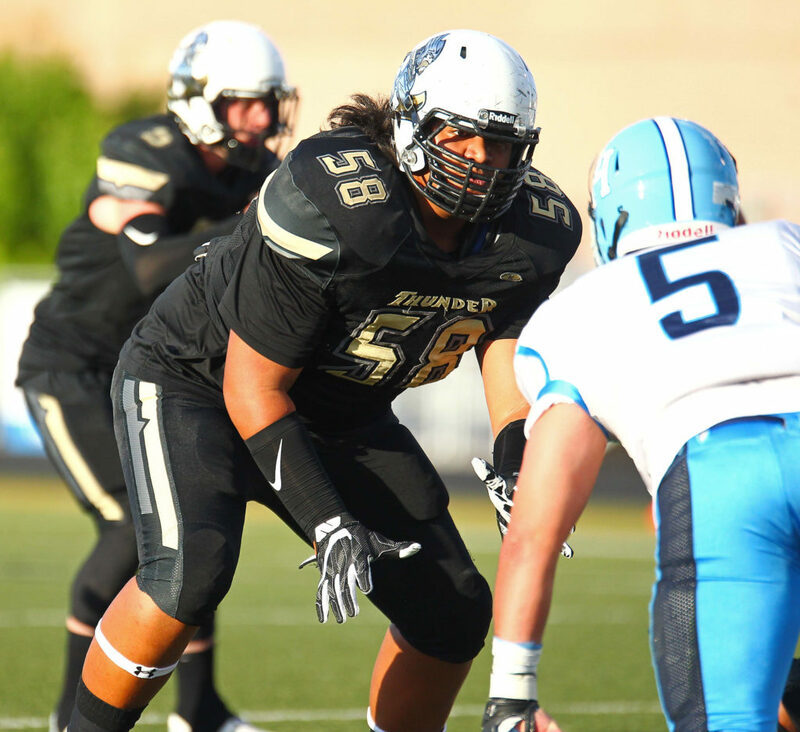 Ammon Ah Quin gained 90 yards rushing. Lone Peak improves to 2-0 with the win. The Flyers fall to 0-2 and will play at Alta next week. Snow Canyon first-year head coach Mike Esplin wanted a lot of things out of his team’s road trip to Idaho this week. He wanted team bonding. He wanted to get to know his players better. He wanted a Snow Canyon brotherhood to form. But mostly, he wanted consistency. And a win. Perhaps the Warriors accomplished the first part of that equation. 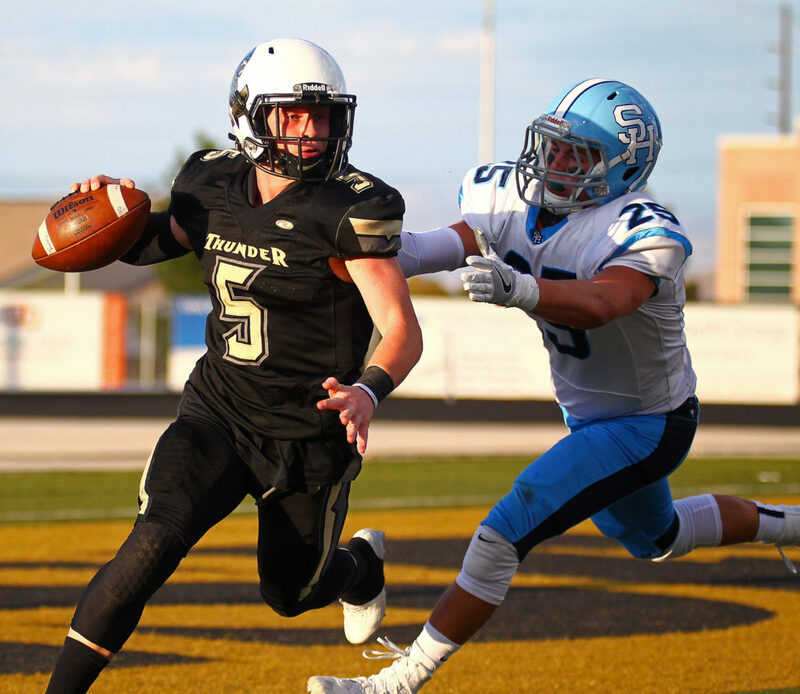 But the win was a little harder to come by as an experienced Shelley team, led by star quarterback Bryon Leckington, was just too much for Snow Canyon. The game started well enough, with backup quarterback Austin Staheli (filling in for injured Matt Kitchen) hitting Tyson Deland with a long TD pass. A Kolton Barber field goal put SC ahead 10-0 in the first quarter. But the Russets came out red hot in the second quarter, striking for three unanswered TDs. Leckington had touchdown runs of 5- and 15-yards sandwiched around a 39-yard passing score to Matt Leal. 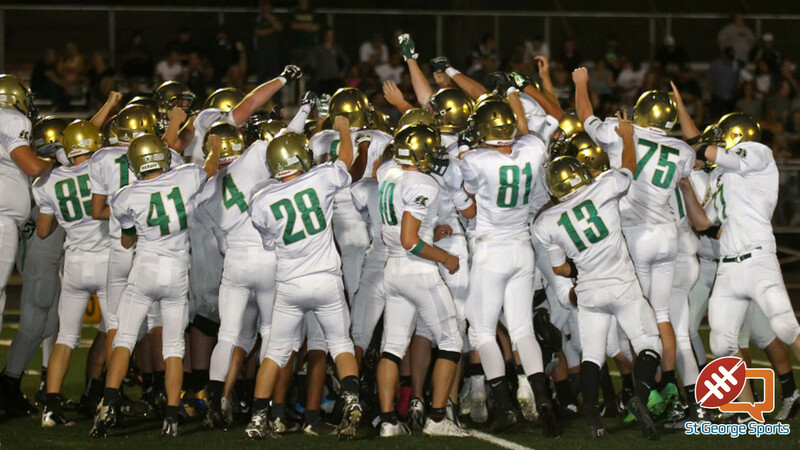 Two of the three second-quarter scores came right after Snow Canyon turnovers. Shelley made it 27-10 early in the fourth quarter with a TD pass from Leckington to Angel Herrera with 10:21 left. The Warriors struck right back as Deland caught a Staheli pass for a 31-yard score. But SC couldn’t muster any more offense after that and took the tough loss. SC averaged more than five yards per play in the game, but was just 4 for 15 on third and fourth downs. Shelley went 7 for 13 in those same situations. Chris Poulsen, who had 153 yards and two TDs last week, was held to 51 yards and no scores. Staheli was 10 for 20 for 122 yards. Deland caught three passes for 74 yards. 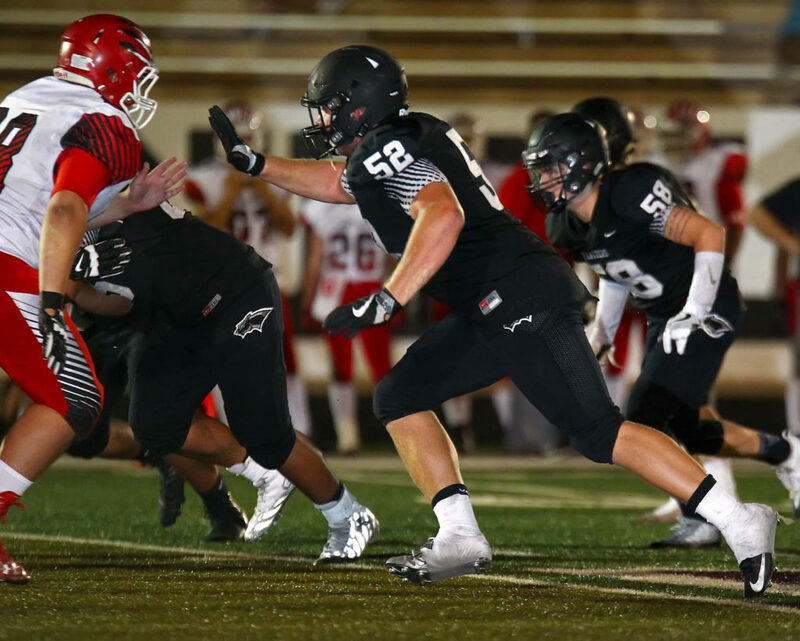 The Warriors, 0-2, will host their Homecoming game next Friday at 7 p.m. at Warrior Stadium against the Carbon Dinos, who are 0-2 and have been outscored 104-15 in two games this season.